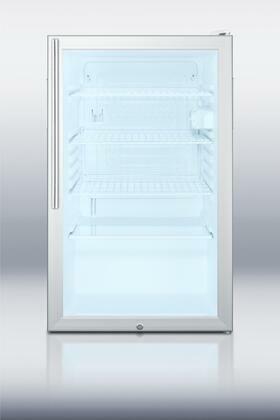 The SCR450LHV is a counter height all-refrigerator with a 4.1 cu.ft. capacity. It has a white cabinet with a glass door and sleek stainless steel handle. The factory installed lock offers security and a hospital grade cord with a 'green dot' plug provides additional safety in high traffic areas. 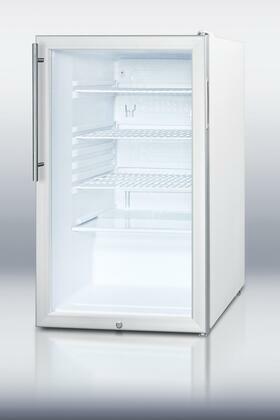 Inside, the SCR450LHV includes adjustable shelves for attractive and convenient storage. The interior light functions on an on/off rocker switch and an adjustable thermostat offers easy temperature control. At just under 20" wide, SUMMIT SCR450LHV is an easy-fitting beverage refrigerator fit for any setting. If you want to keep food fresh and prevent any cross-contamination of odors and flavors, get this Summit refrigerator and you won't regret it. I had no idea Summit made such luxurious refrigerators. This All Refrigerator model was way under our budget and looks so modern in our kitchen. I love it! My kids absolutely love the water and ice dispenser on our Summit refrigerator. I think they just love pressing the buttons! Either way, the All Refrigerator design looks terrific in our kitchen.